The DVD rental market is evolving, and Original Video machines are a product of this evolution. Recent market developments are supporting Original Video’s view that traditional rental stores will become obsolete by 2012. The DVD is still firmly established as the home entertainment format of the present, and with the forthcoming introduction of higher quality movies through Blu-Ray and HD-DVD formats, the future development of the market is assured. 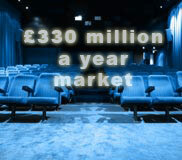 In 2006 there were over 116 million DVD rental transactions in a market worth £330million in the UK alone. This has made the UK's consumer expenditure on DVD (rental) second in the "Entertainment and leisure goods and services category", behind drinking and eating out.